DIRK KRONEMEIJER n the wake of COP 21 and in ad- requirements will take effect in North investment, but also has a long way to operational systems can remain in place vance of any subsequent IMO rul- American and U.S. Caribbean ECAs go before the global infrastructure is ca- and every party can stay in a ‘business- ing on the environment, it may from January 1, 2016 for vessels with pable of effectively supporting vessels as-usual’ mode. Marine & Industrial Equipment fering incentives for vessels that exceed requires less engine maintenance than ® environmental targets. For example the ship operators will be accustomed to. 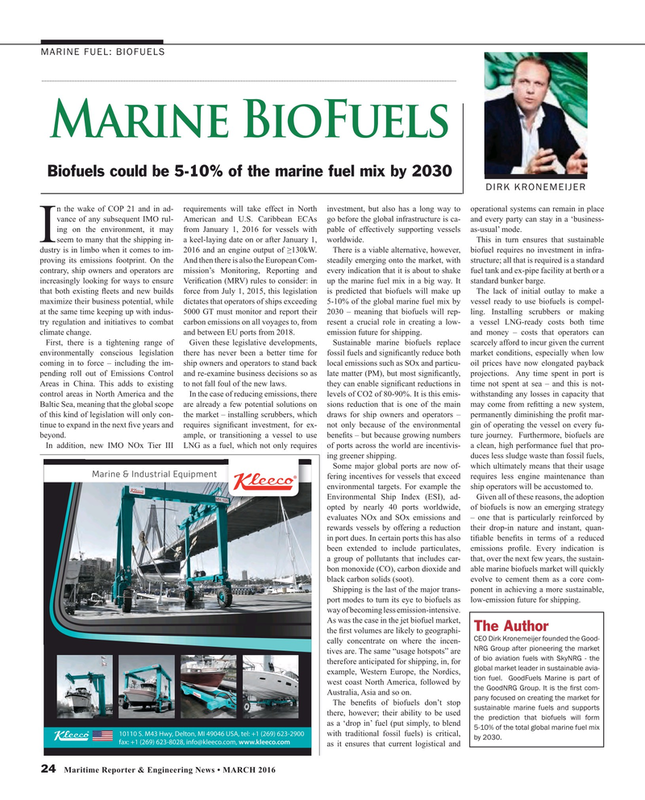 Shipping is the last of the major trans- ponent in achieving a more sustainable, port modes to turn its eye to biofuels as low-emission future for shipping. way of becoming less emission-intensive.